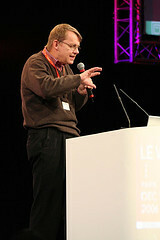 Hans Rosling was an inspiration online at the TED talks, but to see him do his thang offline is worth the delayed aeroplanes, the Paris metro and even the microfood buffets. His work and his company Gapminder has evolved around turning raw information from the United Nations and other statistical organisations into some kind of knowledge which he then interprets for us in his live show, providing us with some wisdom as to how and why the world works as it does. His main thrust: we must stop thinking about globalisation and start thinking about modernisation. Globalisation, in other words, is not about America exporting what it does as the 'global' way, a preconception most of us are all but too happy to believe. It is rather about the rest of the world finding its way through simple modernisation of ideas, technology, science, design and processes. Example: Bedrooms have not globalised, but they may have modernised. Current thinking has us believe that rich country families comprise lots of money and few kids, with poor countries creating little wealth but lots of children. It is likely, though, that by 2050 the world's population will have stabilised at 9-10 billion people but this is not through some spreading of globalisation. It is down to the modernisation of the bedroom - a Bangladeshi who has discovered the condom is more modern than Hans' Swedish grandfather who, er, hadn't. Likewise, mortality is not down to globalisation, but modernisation. Kitchens and bathrooms have modernised to stop people getting sick and dying early. The world, therefore, is not made up of East/West, Poor/Rich, First World/Third World. It is made up of an unmodern bottom 20%, a highly modern 20% and a cast swathe of fairly static 60%. This middle ground of 60% don't give aid or receive it - they just make do. For me, this struck home with the average classroom. We often talk about providing extra support for the bottom 20% (the poor kids) and enjoy the [rich] contributions of those in the top 20%. But we do tend to ignore the vast swathe in the middle (rest of the world). These kids neither give aid (answers, enthusiasm, interaction, collaboration) nor receive it (teacher help, excitement, enjoyment, collaborative opportunities, partnerships, decision-making). The same is true in organisations of any kind. There's a wee chapter on the "Bell Curve" of organisations in The Big Moo: every country, organisation, group of people is filled with a large majority stuck in the middle of a bell curve of normalness. Some people choose to sit a little behind the curve, catching up most of the time, others tend to keep ahead of the curve a little and try to innovate. But most organisations average out in averageness. The trick, it would appear, is to change the mental shift of the whole organisation (bottom, middle, top and all the bits inbetween) to make "being exceptional" a normal thing. The consequences of potentially missing out this collectively less exceptional, normal 80% who just "make do" are grave. Just take a look at your own family tree. Hans did (or click the picture to the left to enlarge in a new window). His Great-Grandmother was on a health and progress rate similar to current day Sierra Leone. By the time his grandmother was born the socio-economic situation of this average Swede was equivalent to current day Mozambique. His mother's situation was close to that of Egypt while he felt very much the Mexican of the family. His daughter's situation at birth would resemble current day Chile and his Grand-daughter will probably be around the same socio-economic situation of Singapore. By ignoring the language, culture and opportunity that lies in the countries of our poorest neighbours now we are only setting ourselves up for a fall. In most of these countries, talk of the net and social media providing democracy and free speech for citizens comes a long second behind health, education, micro-credits and, oh, human rights. Micro-loans popped up a lot during LeWeb3, in fact, as a way of letting entrepreunerial spirit and autonomy make individuals, cities and countries grow faster and healthily. The same is true, I believe, in our organisations and schools. Most of our schools, though, have the basics and the internet is, for me, the next basic commodity this 80% need to grasp. It's not as a means to 'receive aid', though, through Google searches. The 'micro-loan' we can give our teachers and students is to show them how to take control of the web by publishing on it, becoming autonomous in their learning and finding their way in the world without dependency on others. Becoming exceptional, in other words. Pavements are free to use in most countries, so why not make "intellectual pavements" to bring skilled people to our industries? Hans believes we must challenge closed learning environments, and let them instead be open and competitive. I like the idea but wonder where national and local interests lie in most countries, especially those who feel they are currently occupying the 20% of exceptional education systems (Scotland included?). Barely a year ago I was struggling with some local authorities to get material which already existed out into the open market. If the material is already there, or in digestible formats, why should it be locked away and not benefit the wider, global - modernising - community? The pay-off for the education system that harnesses the power of its professionals is significant: higher value given to teachers' and students' work measurable in quantitative (hits) and qualitative (comments) ways; more exporting of knowledge, expertise and workmanship; more importing of students to our universities and schools. There are huge parallels between modernisation of our planet, the sharing of our education with the rest of our planet and the survival of our planet. Without all three I believe our very future here is under threat. What can Scotland do to start modernising and not globalising? What can your country do? Yes - but another important point about the difference between the words "globalisation" and "modernisation" is the connotations. By labelling some parts of the world "modern" we are equating current "advance" in thinking with something "better"? Education is important for some things (providing education to women in some countries has vastly improved health in families, for example) but sometimes education simply creates more intelligent terrorists?